StClair DNA: Different surnames. Same blood. If you're following this blog, you'll notice that I'm obsessed in tracking down particular medieval families who changed their second names. I don't even call them "surnames" because of their fluid use of land-based names. Richard Ferguson (p. 286) has Robert, Baron of Dalston as the brother of Hubert de Vallibus (the Latinized spelling of Vaux). The Dalston Barony was granted by Ranulph de Meschines to Robert, brother of Hubert de Vallibus, Baron of Gilsland. That Hubert was the Baron of Gilsland, grandson of the founder of Pentney Priory. Hubert and John de Vaux had come north at the invitation of David I. Many older books state that they were brothers, but there's no primary evidence of this. Hubert received Gilsland from Henry II. John received Dirlton in East Lothian, Scotland, on which he later built Dirlton Castle, about 13 miles north of the Morville family seat of Saltoun Castle. 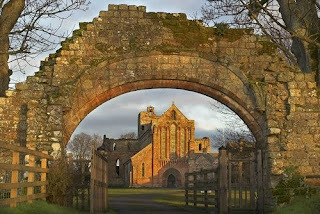 The Morvilles were giving gifts to Lanercost Priory, witnessed by the Maitland family, among others. The descendants of Hubert's brother John patronized Dryburgh Abbey. Hubert's son Robert founded Lanercost Priory beside Hadrian's Wall in 1169. My current obsession with Dalston started after seeing the spelling Dalton in the STR matches of a particular lineage in our Sinclair DNA study, and them bumping into the connection in the records pointing to a blood relationship with the de Vaux family and the Morvilles. Guidebook to Dirleton Castle, which I picked up at the castle in October, 2012. Published by Historic Scotland. A few minor updates on the Dalston story, none of which really changes your point about the connections. Hubert de Vaux did receive Gilsland from Henry II in 1158 (the charter to him and his son Robert remains) and a branch of the family took over the barony of Gilsland and took the name Dalston. The Dalston line later fell afoul of Henry II and was attainted (lost their title & main estate), but the family continued and was re-knighted as baronets in 1641. The fourth Baronet Dalston was the last (d. 1765) and the family name appeared to die out in Dalston although it certainly COULD have continued either there or elsewhere through unrecorded lines. Their main manor Dalston Hall was sold in 1761 but still exists (Google Earth 54.855031N, 2.972697W) and today is an upscale small hotel that caters to weddings and family gatherings. There is no evidence that Hubert de Vaux of Gilsland and John de Vaux of Dirleton were really brothers although all the old histories assume the families were related, and there are several hints in the old records that they were connected. There are surviving family lines that are believed to descend from the Dirleton de Vaux; it would be really interesting to find some male lines from the Gilsland de Vaux to compare DNA. There are other de Vaux offspring who took other family names, by the way; some examples include Castlecarrock, Raynes, Virley, and Welles, although some of those connections are just anecdotal in the old histories and I have not pursued how verifiable they are. I'm rather late to the party on this but I just want to thank all you Vances for your remarkable resurrection work on the de Vaux. The family is still confusing but much less so than it was yesterday. Thanks very much for the notes Dave. You and your family are doing a great job of researching your history. My recommendation for you would be to take Family Tree DNA's Family Finder test. Of course, if you have a male relative who's a descendant of the Sinclair your great gran married, then he could test with a YDNA kit. Contact me at SaintClair1398 (at) gmail (dot) com and we'll discuss how to get this done.